El Clasico last night between Real Madrid and FC Barcelona ended with the visitors having had the last laugh at the Santiago Bernabeu. Thanks to two goals from Uruguayan striker Luis Suarez, and an own goal from French World Cup winner, Raphael Varane, Real Madrid lost 0-3 to the Catalan giants. 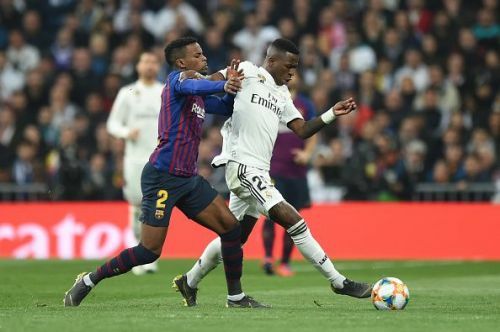 Vinicius Jr and Lucas Vazquez were given the nod ahead of Gareth Bale and Marco Asensio, while Barcelona's Philippe Coutinho and Arthur started on the bench. It was a disappointing night for the men in white, as they did everything possible in attack to break down the stubborn FC Barcelona defence, but were unable to, thanks to a heroic performance by goalkeeper Andre ter Stegen. 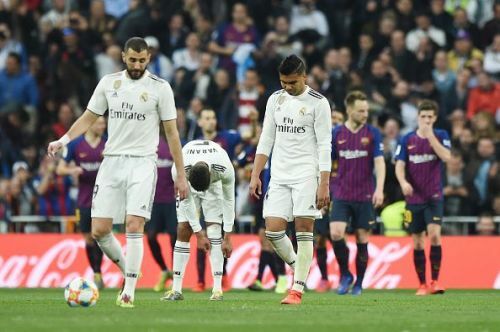 After this heavy and embarrassing defeat against their big-time rivals Barcelona, Real Madrid definitely have some points to ponder upon, if they are to bounce back from this debacle and focus on their remaining matches this season. Let's look at some of them! In Karim Benzema, Vinicius Jr, and Lucas Vazquez combined, Real Madrid had 14 shots, as compared to FC Barcelona's 4 in the match last night, and it was literally a shame for the galacticos that even after dominating the game for 90 minutes, they suffered the defeat by a 3 goal margin. Out of the 14 shots Real Madrid had in the match, only 4 were on target, while FC Barcelona had 2 out of the 4 on target, which resulted in the two goals they scored. Real Madrid should actually work on their finishing if they are to grab their chances, in big matches like last night, and definitely in league matches against smaller oppositions.